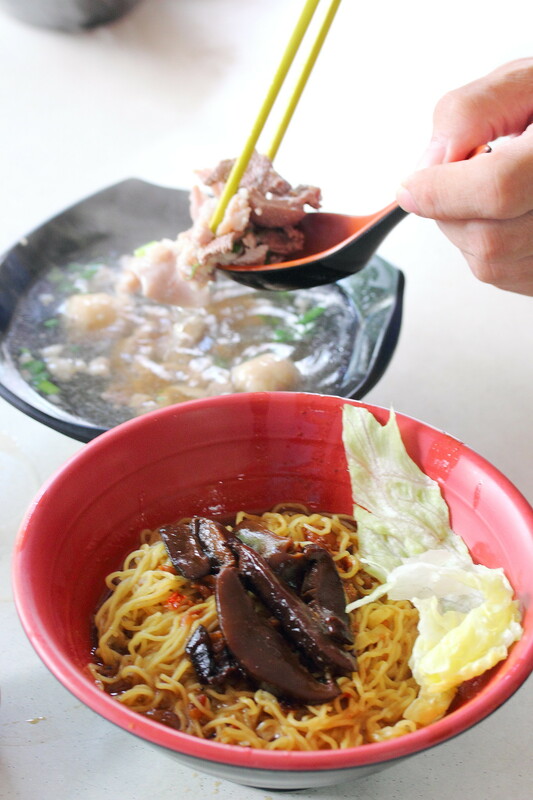 After Tony aka JohorKaki blog about Kim Bak Chor Mee, I made my way down to Kim Bak Chor Mee at Balestier Road to check out the stall that serves one of Singapore's favourite food. 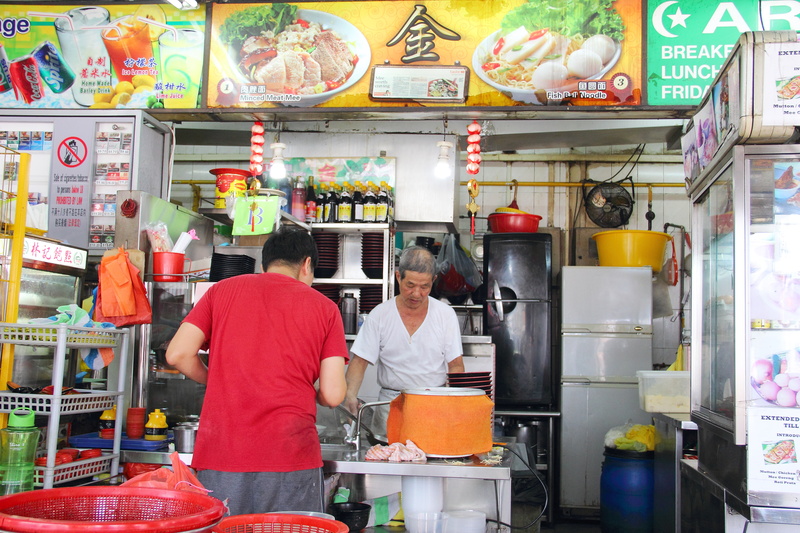 Accordingly to Tony's blog, the stall uncle (Mr Ng) eats his own noodles everyday, that is what he learnt from his master. This is to ensure he likes his own food before servicing it to others. Unfortunately I did not get to sight the uncle doing so but I do get to have a brief chat with him. He recited the same teaching from his master. 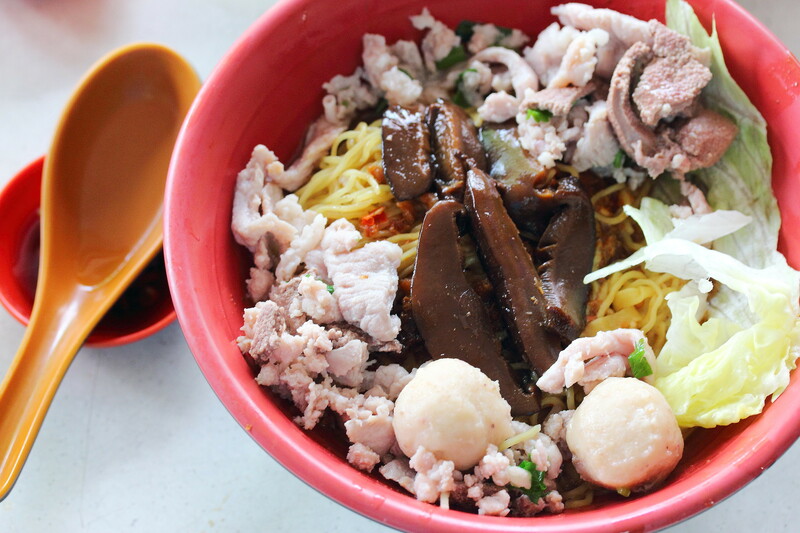 Unlike most stalls, the Bak Chor Mee here is served as such that the ingredients are separated from the noodles with the minced pork, lean pork, pork balls and pork liver in the soup bowl. As to ensure that the ingredients are not overcooked in the bowl of delectable soup, I was advised to quickly transfer the ingredients over to the bowl of noodles. 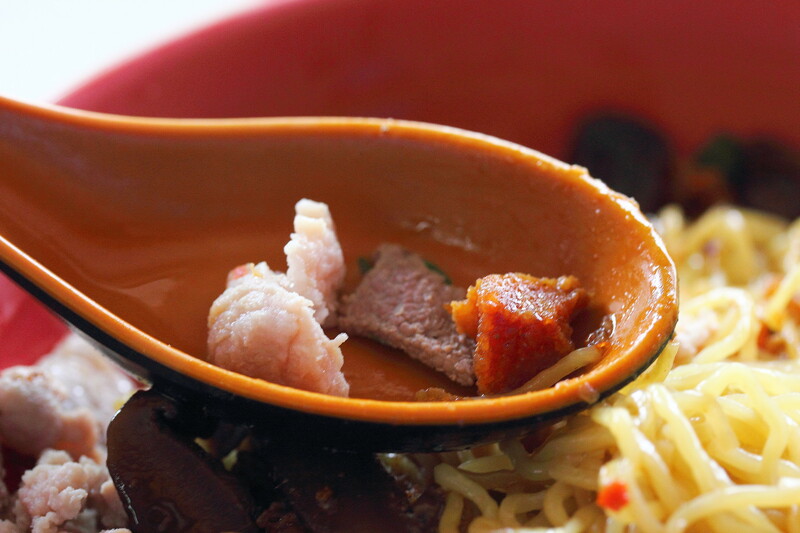 As you can see from the bowl of noodles filled is filled to the brim with ingredients. A worthy note is the mushroom. The mushroom is thickly sliced, well braised and has a nice bouncy texture. This bowl of slurping goodness uses little vinegar unlike the popular Tai Hwa allowing one to appreciate the aroma from the pork lard more. 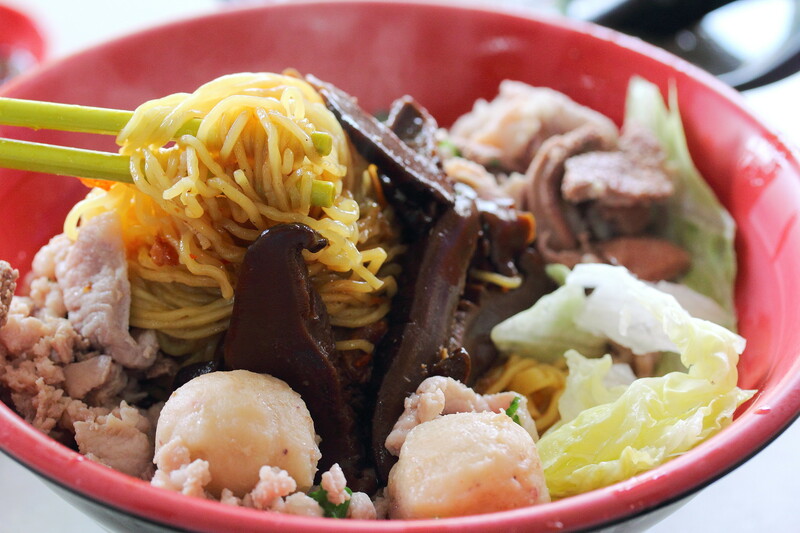 The bowl of noodles may not wow in you an instant, you need to toss the noodle together with the specially made chilli sauce to slowly appreciate how the different components come together making it a good bowl of bak chor mee. I would say it has a more rustic taste compare to many other places where the flavours are more robust. 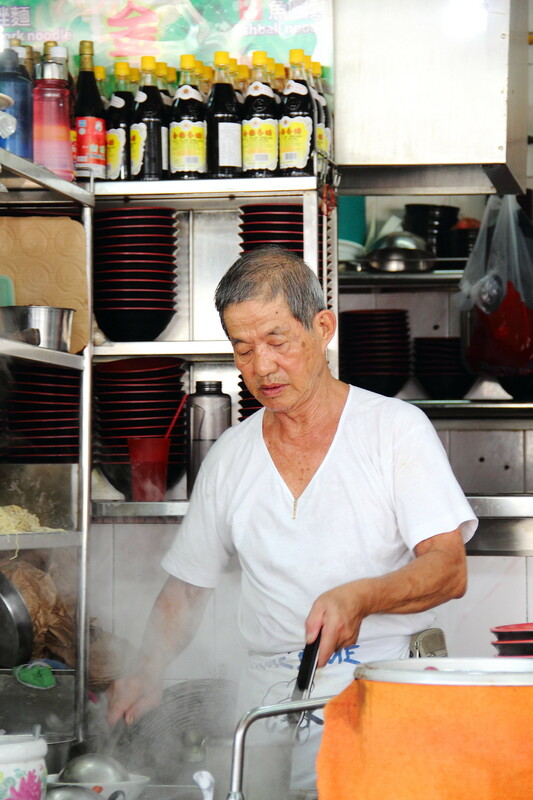 Mr Ng aka Mr Bak Kut has been in the trade since the age of 11, he is now in his 60s. He is better known as the founder of the popular Sing Hing Seafood Bak Kut Teh stall from the demolished Lakeview Food Centre near MacRitchie reservoir. That is also how he got his nickname Mr Bak Kut.